By Grady Booch, Michael W. Engle, Robert A. Maksimchuk, Jim Conallen and Bobbi J. Young, Ph. D.
Dimensions 1.75 by 7.50 by 9.75 in. About: Object-Oriented Design with Applications has long been the essential reference to object-oriented technology, which, in turn, has evolved to join the mainstream of industrial-strength software development. 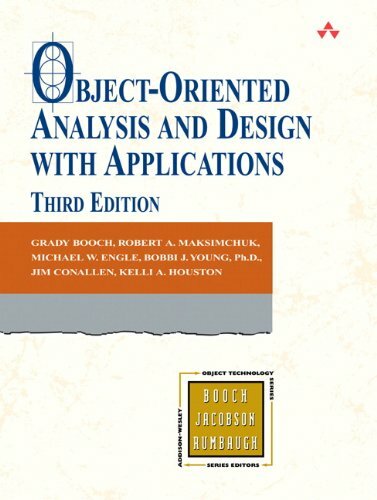 About: This revised new edition of the bestselling Object-Oriented Design with Applications answers the call for an industry standard in the notation and process for developing object-oriented systems. About: In the Second Edition of his award-winning book, Grady Booch draws upon the rich and varied results of the hundreds of projects which have applied the notation and method presented in the First Edition to offer improved methods for object development-including a unified notation.